Fatigue wave free-improv soundscapes from Will Scott + Myles Bartel + Smokey. They’ll be dropping their new cassette “Live at Skymall” via Sweety Pie Records and Double Lunch Records. The cassette features a full performance by the original trio from a 2014 Bermuda Festival afterparty show + another from earlier this year w/ Smokey! This entry was posted in BLOG and tagged bermuda, double lunch, field & stream, field and stream, fitness, Jenna turner, l.n. baba, look away, molan, myles bartel, nickelas johnson, Nolan bossert, Parker thiessen, power buddies, private investigators, sewing machine factory, skymall, smokey, soft ions, sweety pie, the olm, will scott, zebra pulse on December 4, 2017 by pigeonbreeders. 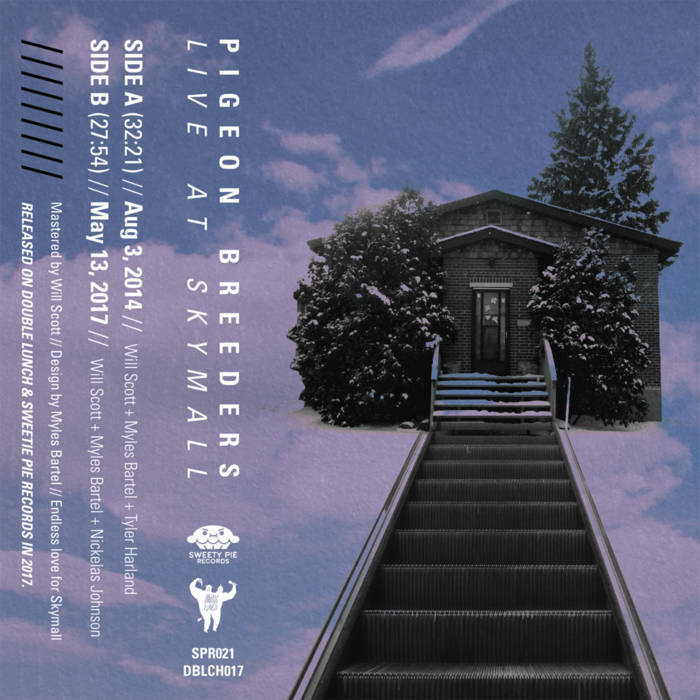 Live at Skymall (CS) – OUT NOW!